First of all, what is a Crémant? It is a sparkling wine made in France but outside of the Champagne region. This sparkling wine is made in the same traditional fashion of Champagne, “methode champenoise.” Only the sparkling wines made in the Champagne region of France can call their wine Champagne. In the Alsace wine region, most of the wineries make a Crémant d’Alsace. 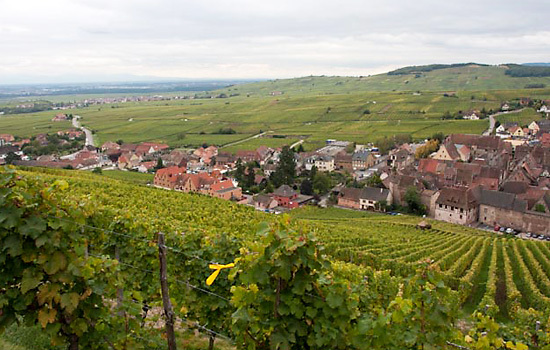 In October of 2010 we had the great pleasure of visiting the Alsatian wine region for one week and tasting a plethora of their wines, including Crémant d’Alsace. Since that trip I always scan the wine shelves for Alsatian wines and while in K&L Wines this one caught my eye, Domaine Allimant-Laugner Rosé, Crémant d’Alsace. The price for this wine at K&L is $18.99 and that is probably a little less than what we paid for the Crémants we sampled on our trip (14 – 16 Euros). It is amazing that in the case of some imported wines you pay less here than in the country of origin. We opened this wine this week and what a surprise. This has to be one of the most fantastic sparkling wines I have tried in recent times. It is almost impossible to believe that you can buy this sparkling wine for a mere $18. This wine is so tasty and flavorful that it is almost impossible to stop drinking. This Crémant is made from 100% Pinot Noir grapes, with the juice on the skins just long enough to give the wine a very light pink color. This dry but zesty wine will go with many foods but we just like it as an aperitif to be savored and enjoyed with operatic music in the background and a good book in hand. We highly recommend it. I purchased the wine at K&L Wines but using Wine-Searcher.com found it at many locations in the San Francisco Bay Area. The Ferry Plaza Wine Merchant in S.F and Beltramo’s in Redwood City have it for $18.00. Curiously, I also found this wine on the shelf at Beverages & More but priced at $21.99. Go figure! Valentine’s Day is approaching and why not try this beautiful sparkling wine with someone special. They will be impressed. Great find! I agree that the Crèmants are a well-kept secret worth investigating. I tasted this Cremant Rose at Left Bank about two years ago and it has been my favorite ever since. I definitely recommend it. Also I recently tried two New Zealand Pinot Noirs (each from the Central Otago region) that were both excellent. 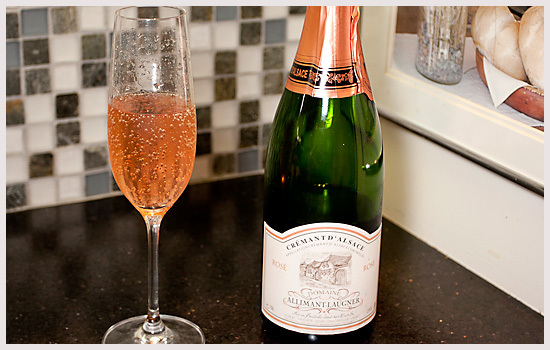 I buy this Cremant at Weimax in Burlingame…as part of a case purchase, it discounts from their $19.99 bottle price to $16.99. They have numerous other little treasures, too in that shop. Great news on the case discount. I visit Weimax often and agree with you that there are treasures to be found. my wife and i found this wine in steamboat springs on new years eve this last year. throughly enjoyed it! just about the most delightful and refreshing sparkling wine i’ve had! i still carry the empty bottle around with me so i can find a new source,(Texas). i will win!